Supermarket group Morrisons has reported its first annual loss after the costs of integrating Safeway pushed it into the red. Bradford-based Morrisons posted a loss of £312.9m ($547m) for the year to 29 January, following costs of almost £375m from the merger with Safeway. Excluding the Safeway costs, pre-tax profits were £61.5m. Morrisons announced a three-year plan aimed at reviving the business by cutting costs and raising margins. 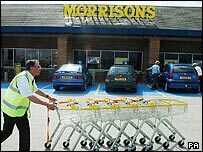 The UK's fourth-largest supermarket, Morrisons bought rival Safeway back in March 2004, but struggled to integrate the business into its own. However, Morrisons said that it had completed the conversion of Safeway stores and was now setting out an "optimisation plan" to lift the newly-combined business. The plan will see the company cutting £30m of central costs and reducing distribution costs by a further £30m. The firm said it would also seek to save "six million staff hours". However, it said there was no redundancy programme and that it would achieve the savings through "natural staff turnover". 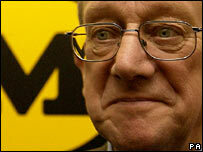 Morrisons chairman Sir Ken Morrison admitted the past year had been "extremely challenging". But he said he was confident the optimisation plan would "quickly deliver significant improvements in performance". Turnover across the Morrisons group was £12.1bn for the financial year, virtually unchanged on the previous year. However, there were signs that sales were beginning to pick up, with like-for-like sales in the seven weeks to 19 March up by 3.2%, an improvement on the 2.8% sales growth seen over Christmas.